AMA Sports Photo Agency was born in 2006. AMA - Agency Matthew Ashton - is based in the United Kingdom providing commercial and editorial picture content for professional picture buyers and clients. The agency began when Matthew Ashton became a freelance photographer in 2006. After covering both the UEFA Cup Final in Eindhoven, Holland, and the UEFA Champions League Final in Paris, France, the next tournament was the 2006 FIFA World Cup. This was Matthew's third FIFA World Cup and a combination of luck and skill resulted in a very successful tournament. As a result, a Football DataCo licence was granted bringing about the ability to gain credentials to cover the English Premier and Football Leagues. AMA has since grown and International competitions including the FIFA World Cup, FIFA Confederations Cup and the FIFA Club World Cup are covered by AMA photographers as are the UEFA Champions League and the UEFA Europa League supplying live content to global clients and building up the impressive AMA online archive for professional picture buyers and registered users to browse and download. AMA are the official photographers to Shrewsbury Town, West Bromwich Albion and Wolverhampton Wanderers. AMA also hosts a bespoke online searchable picture archive. Written in the code of Django in 2015, the complex site acts as a competitive syndication system as well as a home for it hundreds of thousands of great sporting images. 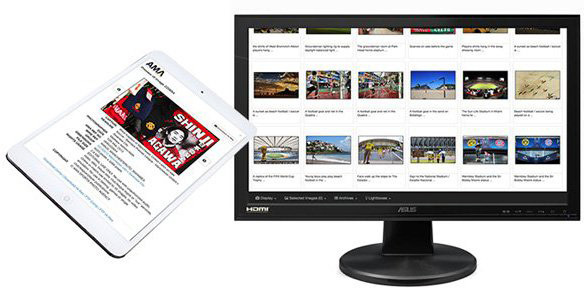 Although the archive is locked up and only available to professional picture buyers, the new site caters for those wishing to browse through images with a AMA Collections and Pictures of The Month sections proving highly popular.